Shop for reliable basement window systems for your home through CK’s Windows and Doors. Our affordable basement escape window systems meet Egress code, and each include a one-year warranty. At CK’s we have it all, whether you need window well bucks, window wells, windows, safety grates, window well covers, or window well ladders. CK’s offers competitive pricing. Homes with basement window systems receive many benefits. Basement window systems offer increased safety for homes, with an emergency escape in the event of a fire or natural disaster. Installation of a basement escape window also increase the natural lighting in basements, which add a greater sense of warmth and character to the overall atmosphere. Basements with windows systems also enhance overall home values and curb appeal with modern window system technologies. Window wells are also now available in new “StackedStone,” an aesthetic addition to window wells which add to its charm and appeal. When you take a look at your basement window well, you can see an attractive stone-looking design instead of a plain metal window well. 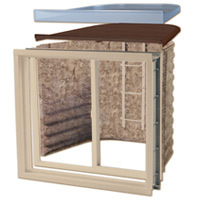 Check out the available window well systems available through CK’s Windows and Doors. 5.7 square feet of net opening.